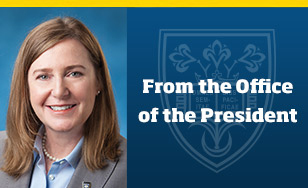 This message was sent to the College Community by the Office of the President on Aug. 30. I am delighted to announce the appointment of Ellen V. Johnson as Vice President for Enrollment Management. Ms. Johnson comes to St. Scholastica from Simmons College in Boston, MA, where she served as Director of Undergraduate Admission. In that role, she led undergraduate recruitment efforts for all first-year, transfer and non-traditional students. During her tenure, she enrolled the college's three largest first-year classes, and used data-driven strategies to increase domestic and international diversity, improve the academic profile of enrolled students, and increase net tuition revenue. Ellen worked closely with the Athletics Department at Simmons to coordinate recruitment efforts for student-athletes. Ellen is an alumna of St. Scholastica, which affords her a special perspective on the distinctive aspects of our educational community. She said, "Attending St. Scholastica was a transformative experience for me, and the College's Benedictine values have helped shape the person that I am today." She began her professional career in our Admissions Office, where she served as an Admissions Counselor and Orientation Coordinator after graduation. Ellen brings many years of impressive experience in higher education enrollment management and possesses a keen understanding of the challenging issues facing private colleges today. Prior to her role at Simmons, she served as the Associate Director of Admissions, Operations and Data Management at the Art Institute of Boston at Lesley University. Ellen also brings special expertise in recruitment communications, having served as the Executive Director of Publication Operations and Response at Carnegie Communications. Carnegie is an industry leader that provides comprehensive strategic marketing planning, including digital marketing and lead generation solutions, to support enrollment management. Ms. Johnson earned a Master of Education in Policy, Planning and Administration with a Higher Education concentration from Boston University, and a bachelor's degree in elementary education from St. Scholastica. I wish to acknowledge with gratitude the contribution of Dr. Brandon Olson, Chair, and all of the members of the Search Committee, for the outstanding work and many hours of service they devoted to the search process. The committee approached its work with integrity, dedication to excellence, open and honest communication, and faithfulness to our Catholic Benedictine values and heritage. I am profoundly grateful. Ms. Johnson joined the College community on Sept. 13, 2017. Please join me in extending a warm Saints welcome to Ellen!